My new fondue pot (Emile Henry) was put into use for a dinner party on Saturday night. A cheese fondue and besides the requisite bread, we had small potatoes, ham chunks, broccoli and cauliflower as well. How can you not have fun when everyone is fishing out cubes of bread that have slipped off their forks? We ate in the breakfast room even though it was a bit crowded for six of us -- but fondue really needs a round table. And that table is found in the breakfast room not the dining room! Menus, of course, so our guests have a souvenir of the evening AND so that our guests know what to expect for dinner. 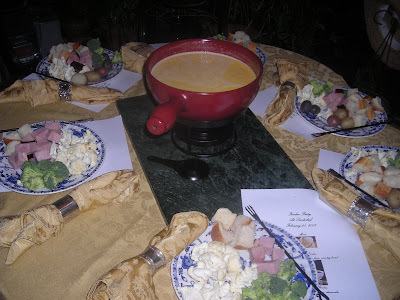 The cheese fondue was a beer and cheddar fondue -- which went well with the vegetables as well as the bread and ham. I liken this cheese fondue to a grown up Rotel dip! We finished with a chocolate fondue in my little white fondue pot (warmed only by a tea light) into which we dipped big strawberries, chunks of banana and my favorite, cheesecake. In a bowl, combine cheese, flour, mustard and cayenne. Mix to blend well. In fondue pot, combine beer and Worcestershire sauce. Put on stove at medium temp and heat until bubbling. Gradually add cheese mixture and stir constantly until cheese melts and mixture is smooth, about 5 minutes. NOTE: Not all fondue pots can be used on top of the stove. 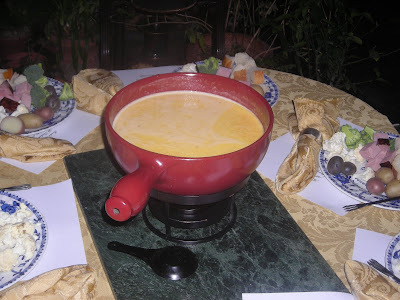 The fondue can be made in a saucepan and then transferred to a fondue pot.